Have a great picture of Edward ? Add it to the photo gallery. "Our condolences to you and your family may God help you cope with the loss of your loved one." 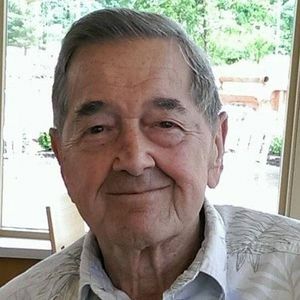 "We will keep your family in our thoughts during this time of sadness and hope the many good memories will help you celebrate Mr. Donner's long life and family legacy. "My deepest sympathy to the Donner Family & Friends. I worked with Ed at the Ridge Tool Company (RIDGID) in Elyria, OH prior to him retiring on or about 1992....? I recall Ed telling me about growing up and living directly across the street from the St Procop Church where I attended mass every day and 1 thru 8th Grade School. I always enjoyed interfacing with Ed at RTC prior to his retirement from the Manufacturing Engineering Department.."
"My condolences for your loss. May the God of all comfort sustain you now and in the days ahead. May God also grant you a measure of peace." "I've known your Dad since he moved in next door to me at Devonshire. We talked over the fence on many occasions and he gave me hints on raising roses. He was a wonderful and thoughtful neighbor. He will be missed. I'm so sorry for your loss." "Dear Donner Family, Although you have never met us, we moved to Devonshire Neadows 2 years ago, and your Dad was one of the nicest and easy-going guys we had the blessing to meet in here. We lived one street passed Ed's. I got to know Ed when he and I, and another fella (Kenny) worked out every morning in the Exercise Room. We had a lot in common to talk about, especially politics! When we had Game Nites in here, he would sit with my wife and me, playing a dice game. He would drive down our street and always stop to talk. He was just a great guy. We will sure miss him, as will all the other friends Ed made in here. I am going to let Kenny know of his passing. Rest in peace, Ed. Sincerely, with our condolences, Tom and Linda Martin (2779)"